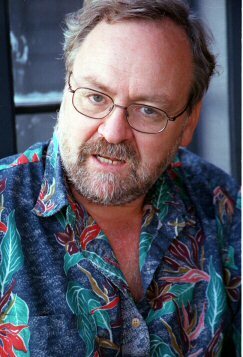 Darcy Russell George was born on Dec. 6, 1949. He grew up in Utah. On some Web sites, he has listed himself as D.R. George. However, he has no college degree. He studied as an undergraduate at the University of Utah but did not complete a degree program. He does not appear to have had any regular employment history, though he has formed and abandoned many of his own companies, often after selling stock in those companies or seeking donations. He has visited many well-known companies and government laboratories for a short while as a guest researcher. There is no record that he has ever been a permanent staff member of any recognized scientific organization. In January 2013, the Canadian Broadcasting Corp. asked Steven B. Krivit to help it understand the common strategies of Darcy Russell George. 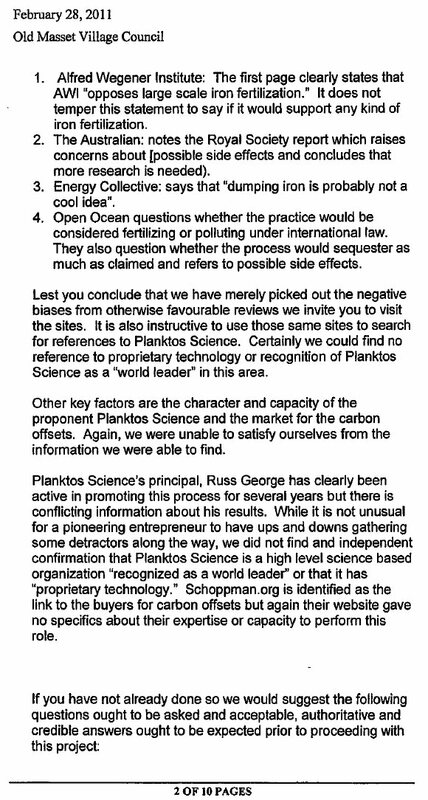 The network was preparing a report on George’s 2012 ocean-seeding project that took place off the coast of Western Canada. CBC contacted Krivit because he had met George and had investigated his related activities over the course of several years. The following list summarizes George's common business practices; a few examples of each follow below. George invents business transactions, sometimes between his own corporations, to give the appearance that those corporations, which usually exist only on paper, have value. Usually, they have no assets. George uses the names of recognized, qualified scientists and institutions without their permission, in association with himself, to give the appearance that his businesses have value, recognition and prestige. George uses the allure of science to give the impression that his proposed technologies are supported by credible scientific research when, in fact, they often are not. Of the credible science that George claims as his own research, most of the data and research belong to someone else. 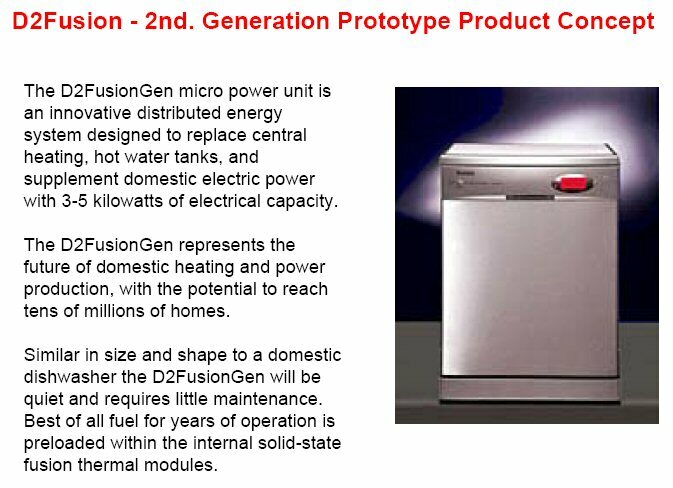 In March 2005, George incorporated D2Fusion Inc., a company that was supposed to produce heating devices based on low-energy nuclear reactions. In August 2005, he sold D2Fusion to Nelson Skalbania's company, Solar Energy Ltd., for a convertible debenture with a stated value of $2 million. In November 2005, George, with Skalbania's cooperation, converted the debenture to shares of stock in Solar. At the same time, George and Skalbania conducted the same set of transactions with Planktos, for a stated value of $1.5 million. Solar had sustained losses for its entire history and had an accumulated debt of $9 million. Solar was never in a position to pay George $3.5 million. These facts did not become public until May, 10, 2006, when New Energy Times published "A Close Look at Russ George's D2Fusion Inc."
George never told his colleagues that he sold his company to Solar for worthless paper. He told them that he sold his company for $2 million, and they thought he had received $2 million cash. As a result, many of them expressed interest in working for George, and some of them purchased stock in his company with their own real cash. The effects of these transactions were as follows: George created the appearance among his colleagues and the public that 1) D2Fusion had assets worth $2 million when it didn't, 2) a publicly traded company like Solar was seriously interested in funding LENR research when it wasn't, 3) underfunded LENR scientists had the opportunity to perform well-funded research when they didn't, and 4) LENR researchers could invest in a well-funded company when the only real cash was coming from them. Source Reference: Solar Energy LTD. U..S. Securities and Exchange Commission 10KSB Filing, A Close Look at Russ George's D2Fusion Inc. In 2001, George tried to sell (and may have succeeded in selling) stock in a private company called Portal Energies Inc. The prospectus for the company says, "The Catalytic Fusion Technology and a device demonstrating this phenomenon are both the inventions of Russ George." Neither of them was. The only catalytic fusion device George worked on was that invented by Les Case. It was replicated at SRI International, and George was a volunteer technician who worked on that project. Portal Energies Inc. had no intellectual property. The prospectus for Portal Energies Inc. says that George sold the catalytic fusion technology to Saturna Technologies Inc. But Saturna was George's company. The prospectus then says that Saturna sold the technology to Portal Energies Inc., which also was owned by George. In other words, George played a shell game to give the appearance, on paper, that the company had value. Source Reference: Portal Prospectus, A Close Look at Russ George's D2Fusion Inc.
An early example took place in 1992. This was documented by John Huizenga, chemistry and physics professor at the University of Rochester and leader of the 1989 Department of Energy cold fusion review panel. Huizenga wrote about George's unauthorized use of scientists' names in his 1993 book Cold Fusion: The Scientific Fiasco of the Century. "Russell George, president, announced the formation of Clustron Science Corporation, headquartered in Vienna, Virginia. CSC promised to introduce innovative commercial applications in the field of cold fusion. The press release stated that the corporation has made a breakthrough in nuclear science and it will capitalize on the business opportunities in the emerging field of new nuclear science. "Clustron Science Corporation received start-up capital from a venture capital firm and a group of investors (Washington Post, Aug. 11, 1992).The addition of a for-profit motive to cold fusion has introduced a new dynamic to the equation that shifts the equilibrium away from verification toward capital, technology and related issues. The [Aug. 10, 1992,] press release contained a list of sixteen supporters (along with short r é sum é s) of the nucleon cluster model, the foundation of the new Science Corporation. Within days it became known that the names of the so-called supporters had been used without their knowledge. Upon being contacted, eleven of these scientists repudiated the model. Of the remaining five, two could not be contacted and two are non-scientists." Russ George: We think we have the crème de la crème of the people in the field. Steven B. Krivit: Is Scott Chubb working with you? Russ George: He’s working with us on this project. We have a world-class team, some Europeans, the Los Alamos people. Krivit fact-checked with Scott Chubb, a scientist at the Naval Research Laboratory, and got an e-mail response from Chubb on Dec. 20, 2005. Steven B. Krivit: I talked with Russ today. … He says you're working for D2. Scott Chubb: I am not working for D2. We may work with D2Fusion through a CRADA [cooperative research and development agreement], but this should be kept confidential, until the announcement. 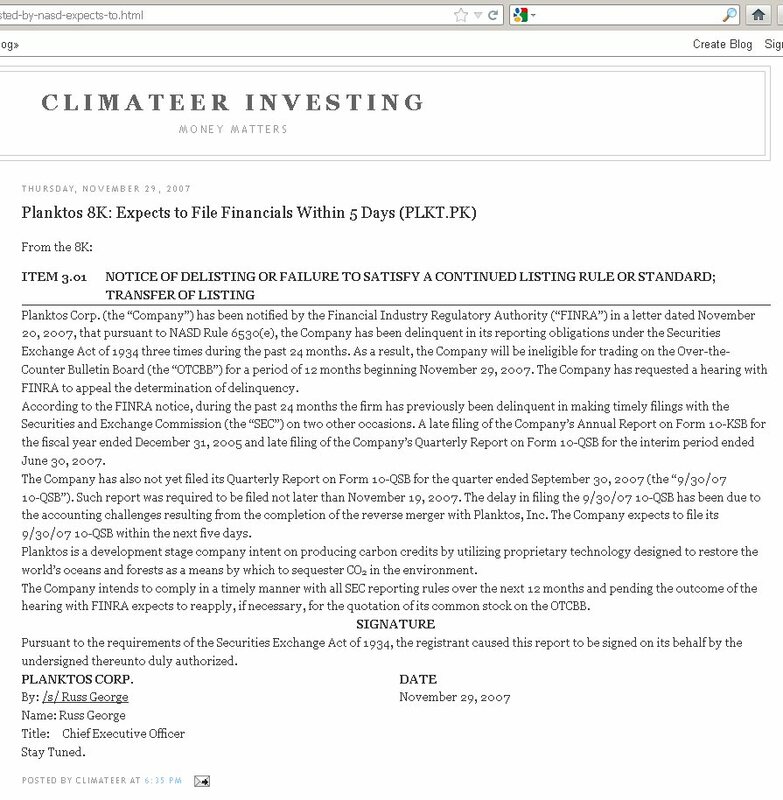 The Solar SEC filing says that D2Fusion "is a research and development company staffed by scientists and engineers." It also says, "The [D2Fusion] teams are led by Dr. Thomas Claytor at the Los Alamos facility (also of Los Alamos National Laboratory)." Steven B. Krivit: Are you part of the D2Fusion team? Thomas Claytor: We're consulting with them, but we're not part of it. We'll be doing the helium gas analysis. We are not doing any research or development for D2Fusion, just the testing, verification, validation, that sort of thing. We haven't seen anything, though; we haven't got anything [to test] from [George] yet. Source Reference: A Close Look at Russ George's D2Fusion Inc.
George lists General Atomics Corp. as one of the many organizations that have contributed to D2Fusion. George once visited General Atomics to give a presentation there on LENR. Krivit asked a physicist there, Michael Schaffer, who had helped arrange George's talk, about George's assertion. 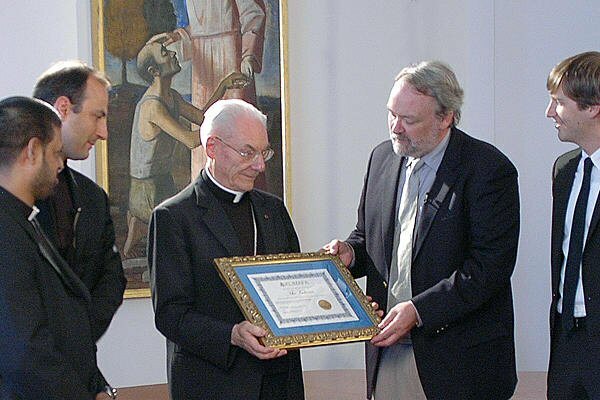 "George spoke about some of his work from around 1999," Schaffer said, "primarily with his palladium-on-carbon catalyst research with his stainless-steel ultra-high-vacuum reactors." Krivit asked Schaffer how General Atomics had contributed to D2Fusion. It didn't. According to Schaffer, General Atomics did end up teaching George a few things. "He would ask questions, and I tried to answer as best I could," Schaffer said. "But the collaboration was very limited." In 2005, two researchers, Thomas Passell and Thomas Benson, who were colleagues of George’s, who worked for themselves, and who performed research in a third-party lab, became affiliated with D2Fusion shortly before the 12th International Conference on Condensed Matter Nuclear Science, in Yokohama, Japan. In their conference presentation, Passell and Benson and displayed their best results: a single experiment that produced 300 milliwatts of excess heat for a few hours. At the same time, George was telling people and advertising that, within a few months, D2Fusion Inc. would be selling 1,000-Watt home heaters. When Krivit asked George on what scientific data he based such a drastic improvement, the only data he offered was the research performed by Passell and Benson. The difference between 300 milliwatts and 1,000 Watts is a factor of 3,000. For comparison, consider an automobile manufacturer selling a car that gets 40 miles to the gallon. Imagine now that it claims that, in a few months, it will start selling a car that gets 120,000 miles to the gallon. But the public did not understand the state of the art in the field. It had no idea that George, Passell and Benson had seen 300 milliwatts only in the lab (which was typical), and therefore people did not know how ludicrous George's promotion was. 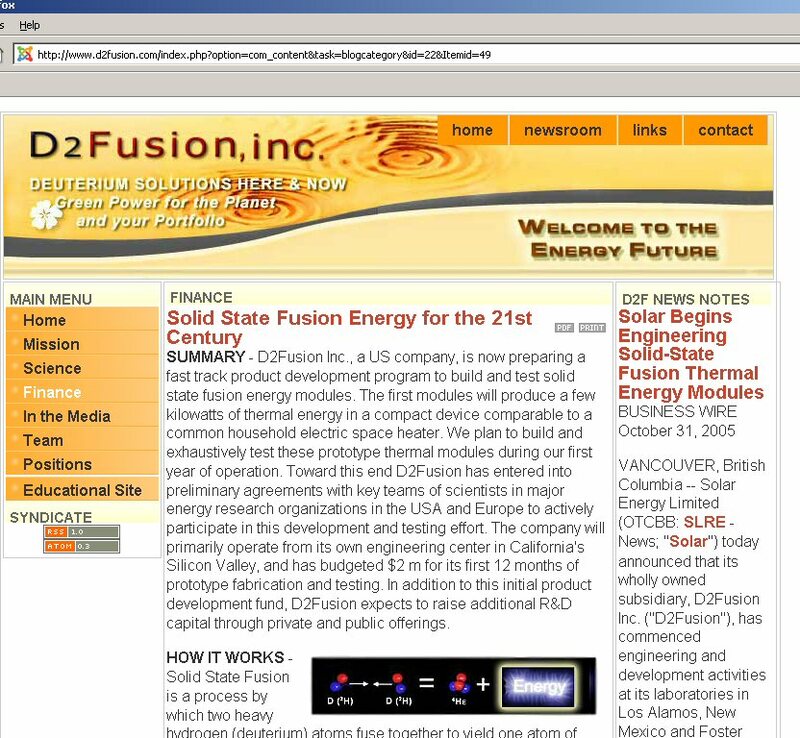 The details didn't become public until New Energy Times published "A Close Look at Russ George's D2Fusion Inc."
Source References: Passell-Benson Slide, D2Fusion Web site, A Close Look at Russ George's D2Fusion Inc. The Solar SEC filing says, "Mr. George’s successful experimental prototypes have been tested at the Los Alamos National Laboratory and Stanford Research Institute." New Energy Times fact-checked this with the Los Alamos National Laboratory public affairs office. "It may be more of a matter of semantics,” Todd A. Hanson, senior adviser for science communications, said, "because Mr. George did test at least one prototype in the city of Los Alamos, just not at Los Alamos National Laboratory. "According to Dale Tuggle, a Los Alamos scientist who has indeed worked as a consultant for Mr. George, they did test a prototype of George's at a private laboratory in Los Alamos. The tests were done by current or retired Los Alamos National Laboratory scientists and, I gather, were inconclusive. I am quite certain our laboratory, as a public entity, would not and could not officially endorse Mr. George's work and/or prototype, irregardless of its merit or functionality." Had the SEC investigated, it probably would have concluded that the difference between "tested at the Los Alamos National Laboratory" and "tested in the city of Los Alamos" was not mere semantics. New Energy Times fact-checked this with the SRI International public affairs office. "The information in this SEC 10K filing is not accurate," Ellie Javadi, SRI corporate and marketing communications director, wrote. "The filing incorrectly implies that SRI International has endorsed Mr. George's work and/or prototype. SRI has not endorsed Mr. George's work or his prototype." Had the SEC investigated, it probably would have concluded that the incorrect filing was fraudulent. In the mid-1990s, LENR researchers Roger Stringham and Francis Tanzella performed research at SRI International on a cavitation system invented and developed by Stringham. All the intellectual property was and remains owned by Stringham. George joined Stringham's company and focused most of his attention on marketing, and he occasionally performed some hands-on research. One of their projects was funded by EPRI. 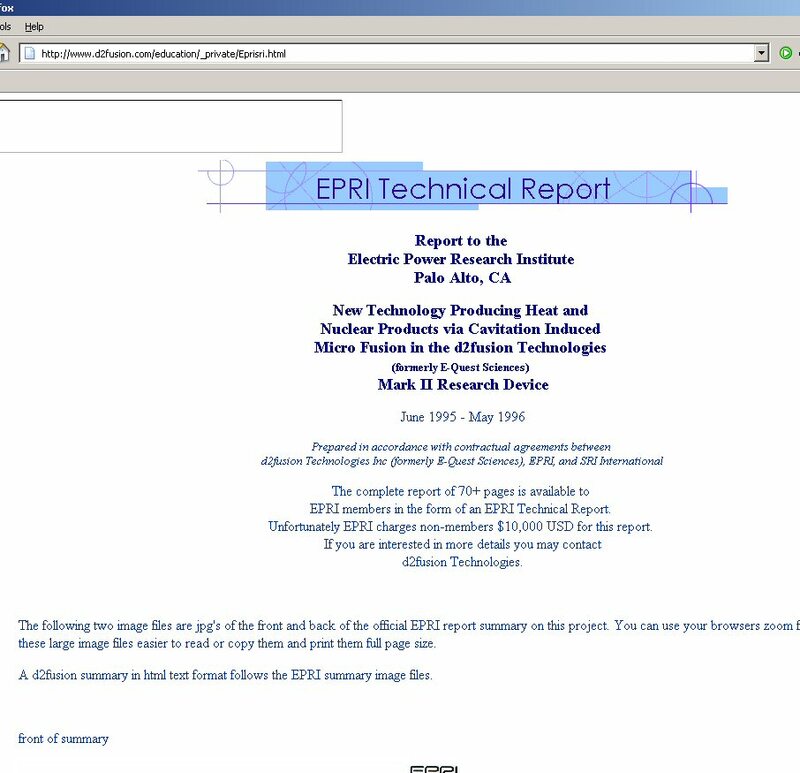 Years later, after Stringham and George parted ways, George fabricated an image of what appeared to be the cover page of an EPRI report on the cavitation work and posted it on his Web site at D2Fusion. George's image of the cover page made it look like the work was developed and owned by D2Fusion. 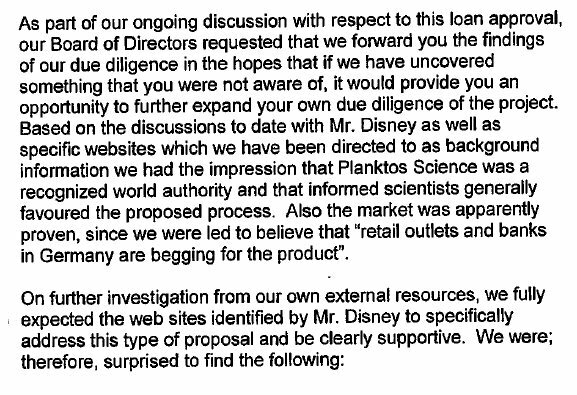 D2Fusion did not exist at the time the work took place, and Stringham, through E-Quest Sciences, never transferred any intellectual property to D2Fusion. Source Reference: George's fabricated cover page image, Real EPRI report and cover image, A Close Look at Russ George's D2Fusion Inc.
As mentioned in 1b above, George tried to sell (and may have succeeded in selling) stock in a private company called Portal Energies Inc. The prospectus for the company says, "The Catalytic Fusion Technology and a device demonstrating this phenomenon are both the inventions of Russ George." Neither of them was. The only catalytic fusion device George worked on was that invented by Les Case. It was replicated at SRI International, and George was a volunteer technician who worked on that project. Portal Energies Inc. had no intellectual property. George was not on staff at SRI and was not paid by SRI. He came to SRI as free labor to SRI, paid for by the Electric Power Research Institute, thanks to his friend and colleague there, Thomas Passell. George had worked on a project for EPRI in 1989 and produced a documentary environmental film. 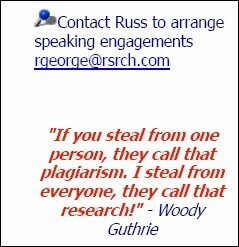 An e-mail from George in July 2005 to Krivit displays his attitude about theft and plagiarism. "In the field of cold fusion, there seems to be a pervasive and absurd desire to define various modalities in terms of single individuals, when in fact the work is highly distributed and collaborative by nature. It is a disservice to all and to the field to continue to try to single out individuals for priority. Woody Guthrie once explained the real roots of creativity best. He said, 'They say stealing ideas from one person is called plagiarism. I steal from everyone. They call that research.'" 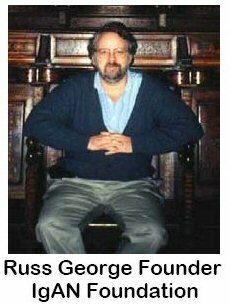 Russ George's "IgA Nephropathy Foundation"
In 1998-2000, Russ George formed IgA Nephropathy Foundation, a non-profit corporation "as a personal quest, following [his] discovery that [he has] this condition." He claimed to be "a scientist and researcher both by profession and avocation." George's now-suspended corporation has nothing to do with the real IgA Nephropathy Foundation of America. His Web site solicited donations from the public and stated that donors "get the maximum tax deduction possible for making a charitable gift of just about anything to the IGA Nephropathy Foundation." George also solicited money from people who might have been elderly: "A deferred gift is a gift that is planned now but does not become available to Igan until a future time. Two common types are the charitable bequest and the gift of life insurance. A charitable bequest to the IgA Nephropathy Foundation can be as simple as a sentence or two in the body of your will." In 2004 and 2005, two independent researchers, Thomas Benson and Thomas Passell, performed low-energy nuclear reaction experiments in a laboratory owned by nuclear researcher William McCarthy in Mountain View, Calif. In a paper Benson and Passell presented in 2004 at ICCF0-11, Benson listed his affiliation as Greenview Group, and Passell listed his affiliation as TOP Consulting. 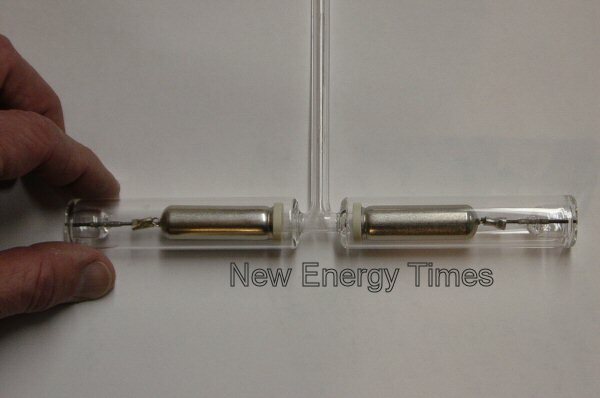 Passell and Benson were working on a glow-discharge LENR experiment to attempt a replication of an experiment reported by other researchers. Passell and Benson did not report unusual heat production in their 2004 paper. In the paper, they list no affiliation with Russ George or with George's D2Fusion Inc. Instead, Passell and Benson thank George at the end of the paper for answering a few of their questions. In 2005, Passell and Benson began to get positive results. They submitted an abstract to ICCF-12; Benson listed his affiliation as Greenview Group, and Passell listed his as TOP Consulting as well as D2Fusion Inc. This is the first document that shows a business affiliation between D2Fusion and Passell. The three men had known one another for a long time. Passell had a significant scientific background as a program manager with the Electric Power Research Institute, in Menlo Park, Calif.
On Dec. 30, 2004, I visited McCarthy's lab, where Passell and Benson were working. Here is a photo of the central part of the glow-discharge experiment. When Passell and Benson gave their slide presentation at ICCF-12, they omitted their individual affiliations that had been on the abstract and listed only D2Fusion Inc. In their presentation, they displayed their best results: a single experiment that produced 300 milliwatts of excess heat for a few hours. Also during the fall of 2005, George was promoting, through his Web site and personal communications, three things: 1) Passell and Benson were D2Fusion Inc. scientists; 2) the results they reported were based on intellectual property developed and owned by D2Fusion Inc.; and 3) within a few months, D2Fusion Inc. would be selling 1,000-Watt heaters. The difference between 300 milliwatts and 1,000 Watts is a factor of 3,000. Imagine an automobile manufacturer which sells a car that gets 40 miles to the gallon claiming that, in a few months, it will start selling a car that gets 120,000 miles to the gallon. When George began promoting his forthcoming home heating unit, the 300-milliwatt experimental result obtained by Passell and Benson was the best result they had obtained. But only George, and perhaps Benson and Passell, knew this. George didn't tell other researchers in the field or the public that the 300-milliwatt result was the best scientific basis for his promised home heating unit. This information did not become public until New Energy Times published this article. "A Close Look at Russ George's D2Fusion Inc." presents many other examples of George's way of doing science and business. One carbon credit is earned when one ton of carbon dioxide has been removed, or offset, from the Earth. From Nick Berning, press secretary for Friends of the Earth U.S.: "Unfortunately, in the U.S., the carbon credits market is currently entirely voluntary, without any oversight. So you can go to Russ George's 'store' on his Web site and buy offsets, and there's no way to know how or whether the offsets are actually delivered." 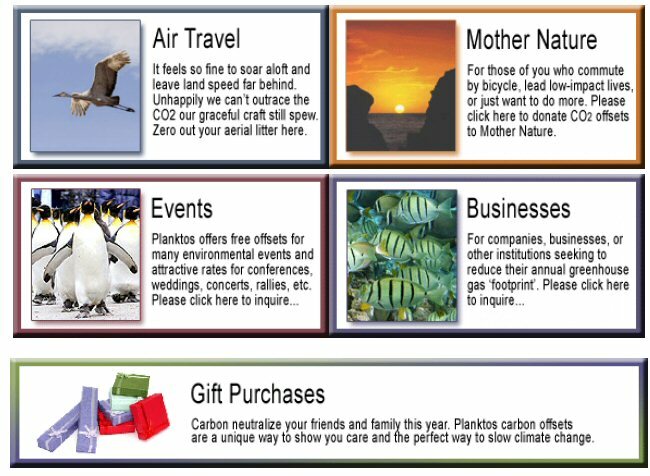 From Russ George's Web site: "Are you flying across the country but want to offset the carbon dioxide emissions generated by your flight? 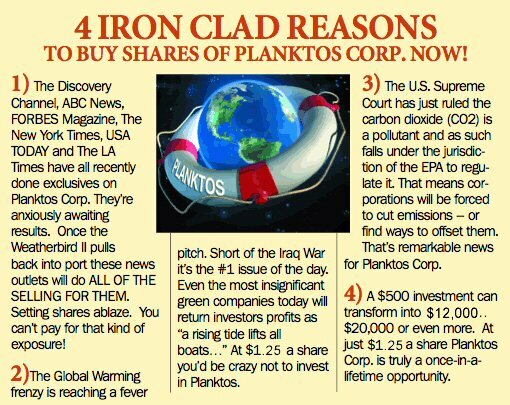 The solution is simple, send $10 to Planktos." "On behalf of Mother Nature, thank you for your purchase. 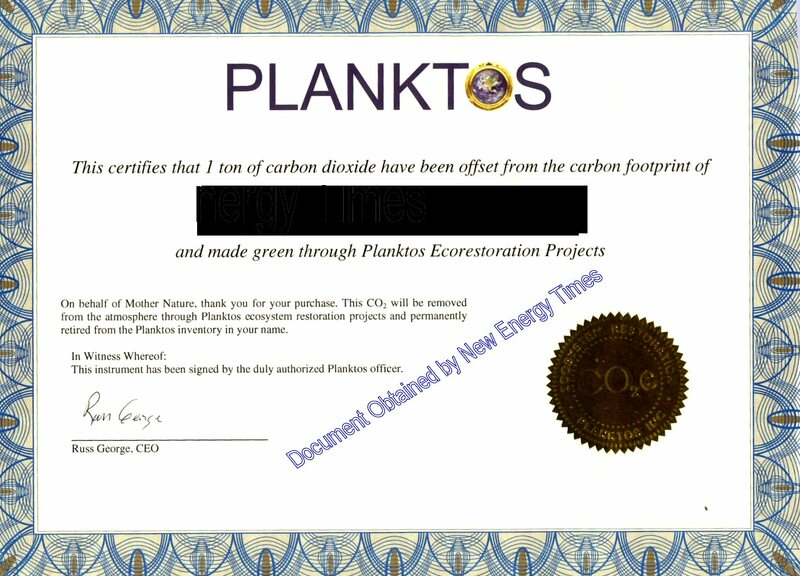 This CO2 will be removed from the atmosphere through Planktos ecosystem restoration projects and permanently retired from the Planktos inventory in your name." But George had no inventory. For the price of a box of blank certificates from an office supply store, George took money from people who believed they were doing something good for the planet. Alternatively, George - theoretically - could sell these certificates for cash to companies that were polluting the environment. Clearly, George was dangling bait for penny-stock investors. By the time, if ever, the investors found out that they had been sold worthless stock certificates, George closed the corporation and set up shop under a new corporate name. Penny-stock investors would have little motivation to mount an expensive legal case against George. 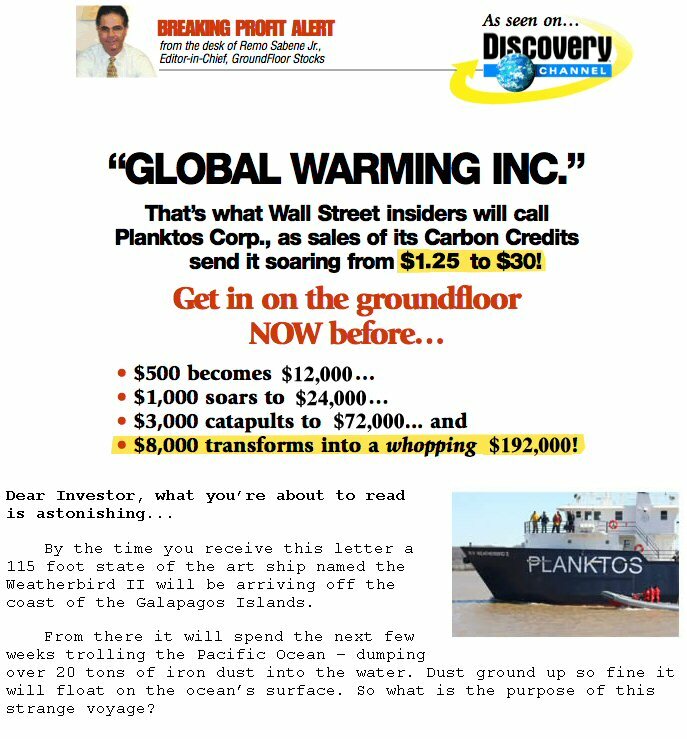 A highly effective disinformation campaign waged by anti-offset crusaders has provoked widespread opposition to plankton restoration in the environmental world, and has caused the company to encounter serious difficulty in raising the capital needed to fund its planned series of ocean research trials. Photo credit: Haida Salmon Restoration Corp.
New Energy Times stopped following Russ George in 2008. At the end of the satire "The Perils O' George" (listed above), the prescient author finished with the words "to be continued." How right she was. After forming a company in 2008 called Haida Climate, George finally achieved his dream of a massive eco-engineering dump in 2012 in international waters off the coast of Canada. He collaborated with a local native group, the Old Masset Village Council, which is part of the Haida Nation. A local man named John Disney worked as George's proxy and sold the villagers on the idea. 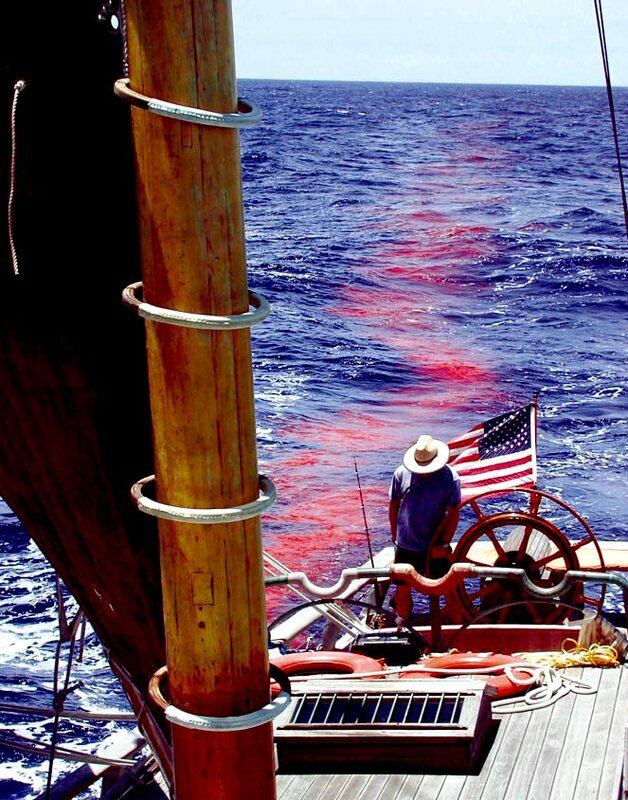 With the encouragement of the council, George and Disney persuaded members of the indigenous community to pay about $2 million to fund George's ocean-seeding venture. 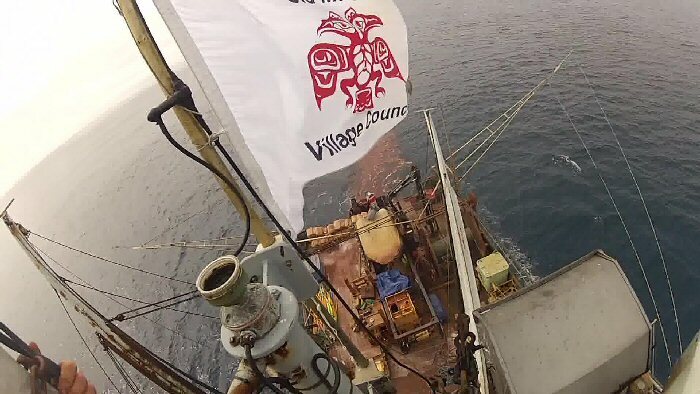 George rented a fishing boat and flew the Haida Nation flag as he dumped 100 tons of iron ore in the ocean in 2012. The Old Masset Village Council declared that it was a sovereign state and therefore not bound to Canadian or international laws. Here's what we know so far about how it happened: George gained the confidence of, and worked through Disney, chief executive officer of the newly formed (2011) Haida Salmon Restoration Corp. Disney, in turn, gained the confidence of the local village council. 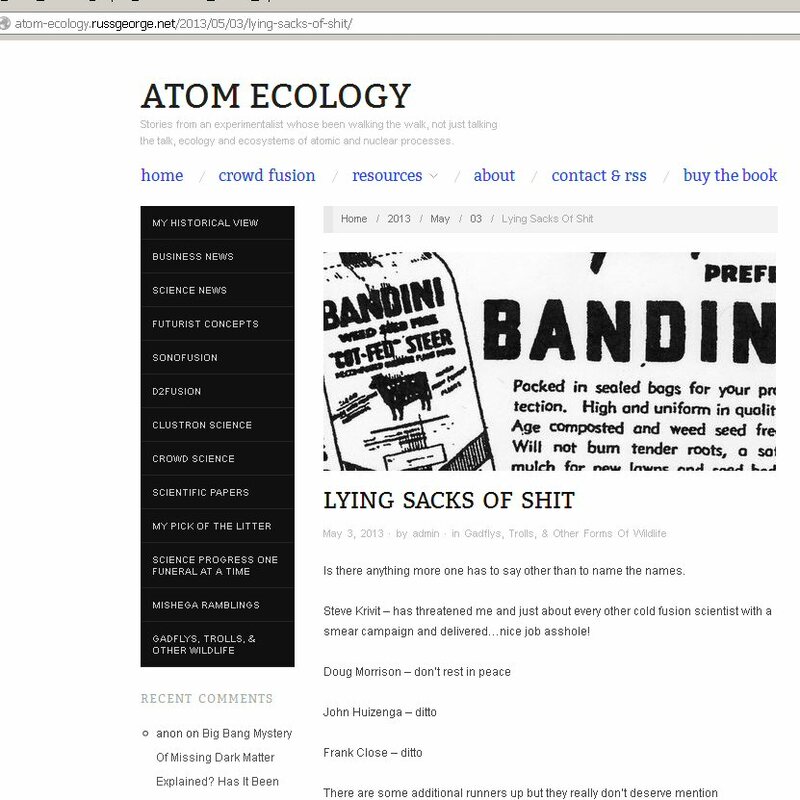 Then the council gained the confidence and agreement of a majority of the community, primarily by assuring them that the dumping program and subsequent plankton bloom would bring the salmon back to normal levels; the lifeblood of their community, economy and culture. George and Disney also promised the council that the venture would permanently sequester carbon dioxide from the atmosphere, that the village could, in turn, issue certified carbon credits, sell them, and profit on their $2 million investment. The Haida Nation denounced the actions of George, Disney and the Old Masset Village Council. George presented the venture as a scientific test, but he has no scientific credentials, has not identified any credentialed scientists who worked with him on the venture and has not published any data on the venture. Journalist Martin Lukacs broke the story in the Guardian on Oct. 15, 2012. The ETC Group reported the news here and created an index of news stories on Russ George's 2012 Ocean Fertilization Scheme Near Haida Gwaii. The Old Masset Village Council failed to heed the bank's warning, did not expand its own due diligence, and proceeded with the project. HSRC Counter-sues George. HSRC says George made false and misleading claims and did not have the expertise he claimed. 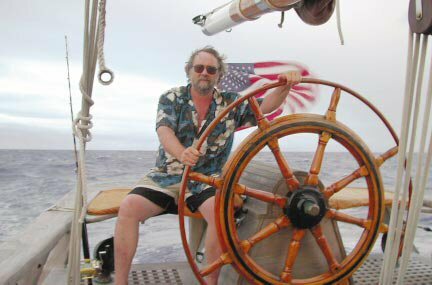 "During the ocean voyage and ship preparations, Mr. George exhibited a tendency to behave in a manner that was irrational, unprofessional and offensive to others, and engaged in certain inappropriate conduct including a physical assault upon the project leader."